I've always wanted to try making one of these double sliding cards. The instructions for the slider is HERE. I used the Stampin' Up! More Monkey Accessories stamp set to create the hat for one of the owls and the wagon. I used a combination of 3 different Stampin' Up! designer series papers. The wasabi dot print is from Woodland Walk. The marina stripe and crumb cake dot is from Elegant Soiree and the riding hood red dot is from a retired collection. I used cherry cobbler and wild wasabi cardstock. I used Nestabilities Label #4 for the front of the card. 2 of the greetings are from the SU! set called Owl Together Now and the "guess hoo?" stamp came from MFT Thinking of Hoo set. 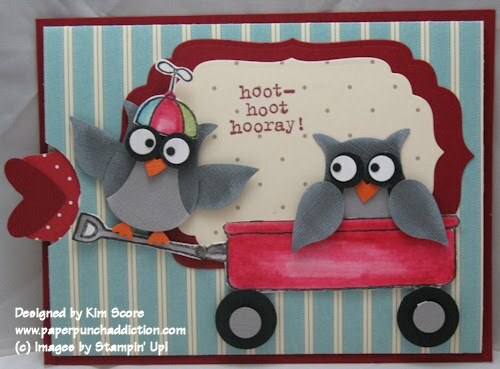 For the owls, I used all of the pieces of the 2 Step Owl punch plus the wing from the 2 Step Bird punch. The birds use basic gray, going gray and pumpkin cardstocks. Very cute... love your slider card! LOVE this double slider card.......they are so much fun to make. Looks great and lots of fun, too. TFS.